Vernal Fall is a natural phenomena which can be seen within the Yosemite National Park. This area is protected which offers beautiful scenes of mountain lakes and the mountains are located in the central eastern part of California, adjacent to the Sierra Nevada. Yosemite National Park was declared a protected natural site in the U.S. in 1890, and it is included in the list of World Heritage by UNESCO. Some 1200 square miles in Yosemite you can see the countless lakes, valleys and mountain hills that are covered with lush lawns and dozens of waterfalls, including the waterfall Verna which is one of the most beautiful. Vernal Fall is located on the Merced River only slightly down from the Nevada Fall. The waterfall is not visible from the main part of the local valley, but could easily be reached in a well marked path that starts near the nature center, which in turn is half a mile from the end of the official automobile road. The route, which leads to the waterfall is very rocky and sandy however, is often teeming with people. The trail is named, The John Muir Trail and starts on the green and picturesque area near to the Merced River itself. Although the official height of the waterfall is 97 meters, the center of geographical research of the United States measured it at 73 meters. The main path which leads to it is called the Mist Trail. The Mist Trail reaches so near the falling water that tourists are literally flooded by millions of small droplets formed by the collision of the falling water and the calm water. Vernal Fall can be visited throughout the year, although at the end of the summer the water falling is less, resulting in the water falling into several channels rather than one large powerful drop as during the colder months of year. In autumn and winter visitors can literally be, wet to the bone, passing through the vague path. The transition takes about 15 minutes, but it leads to the peak of the rocks of the waterfall. The top has formed a small pool called the Emerald Pool. In this zone in the last ten years 10 people have been killed. The last fatality was in 2007 when a tourist attempted to jump from rock to rock of the Vernal Fall. 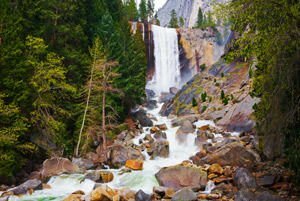 Swimming in the region of Vernal Fall, and in all other waterfalls in the Yosemite National Park is absolutely forbidden, but there are always enthusiasts who believe that the prohibitions do not apply to them. Another waterfall in Yosemite National Park is the Yosemite Falls.